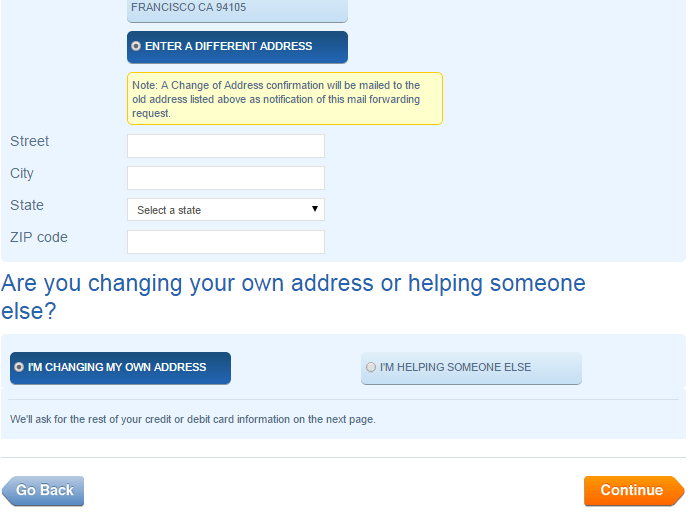 This post will be going through the process of filling the USPS change of address form at the official USPS website. There are many other companies and organizations providing the service, where they file the change of address on your behalf. They usually charge a premium for that which is way higher than what USPS charge. The charges for filing United States Postal Service change of address from at USPS official site is $1.05, which is justified by the security attached the address changing process. While other service providers charge anywhere from $15 to $40. Most of the service providers do make the changes for you but there are some complaints where the person was charged but the address was not changed. You need to be very careful about using such service. They usually never inform post office about your move. Once you have decided that you need to apply for a change of address, you have two options in hand; you can either walk to your nearest post office and fill a form there about your new address or you can fill the same form online, avoiding some common mistakes, in five minutes using the laptop on which you are reading this post. Step by step process of filling the post office change of address is discussed in detail below. You can read it once and then start to fill the form or you can also do both the things simultaneously in different tabs. You should start the process of changing your address by going to the online form available at the official website of USPS, you can find the link also at the bottom of this post. 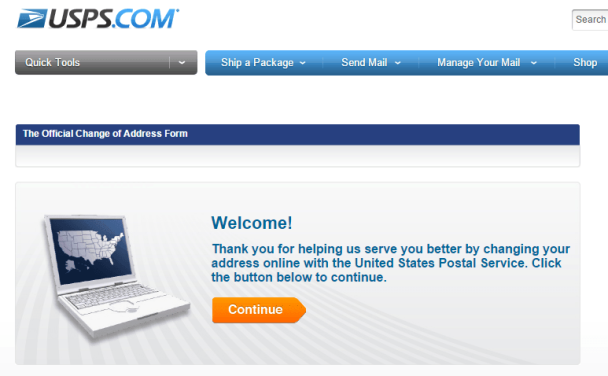 When you go to the USPS’s change of address form you will see a welcome page. You need to click the orange Continue button to go to the next page. On the next page, it gives you some tips and information on charges. There is a clearly mentioned charge of $1.05 to be charged from your credit card or debit card. 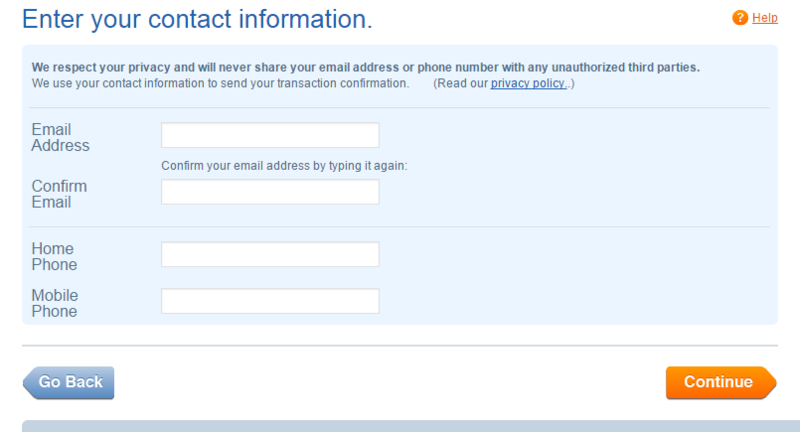 This helps USPS to verify that the person filing the request is real. This form can be filled personally by anyone who wants to update his/her address in post office or he or she should be the executor, guardian, authorized officer of the person whose USPS address change is being done or an agent of the person for whom the update of address is being carried out. 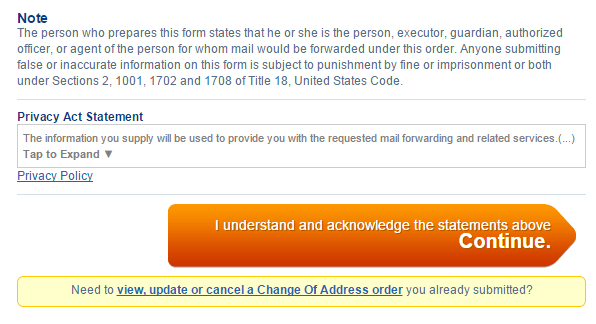 This is clearly stated on the official UMove (This page www.usps.com/umove has been removed by USPS some time back, but the official link mentioned at the end of this post is still good) page, you need to acknowledge that statement before you start the actual change of address process. The first step ‘Move Info’ is divided into three important questions. The most important question is the status of move, weather it is temporary or permanent. If you are planning to move back to the same address within a year then temporary should be marked, even if you are sure about the first six months and your next six months plan in dependent on something else, you should file a temporary change request and then after six months, you should again file the same request. Date of forwarding implies to the date from which you want your mails to be delivered to the new address, you can fill the form after or before moving so you have to tell USPS the date when you want the mail forwarding to start. For example you can file the request within thirty (30) days of moving or if you want to fill the change of address form well in advance than you can do it that upto three months before the date of forwarding. If you apply for a permanent address change than you will see only one date option, ‘Start Forwarding’ date, but if you are applying for a temporary change of address then you will see a second date option as ‘End Forwarding’ which will tell USPS to stop your mail forwarding to new address and resume its going to the old address. The ‘End Forwarding’ date should not be more than six months away from the Start Forwarding date. As it was mentioned earlier, you can apply for temporary change of address for six months and extend it for another six months. In case you don’t know the exact End Forwarding date then it is good to input the best estimated date, and if this date is ever changed , you must inform your local post office about the new/changed End Forwarding date. Another important point to remember is that if you receive your mails by more than one name e.g. your middle name or nick name then a separate postal service change of address form should be filed for that name as well. The next point asks about the type of move it is. You should clearly mention whether it is an individual move, a family move or a business moving to a new address. Here is an explanation of three different types of moves. Individual move is defined as move when a single person from a family is moving and the rest of the family is going to stay at the same old address. If one person in a family has a different surname then the family has to file for a change of address as a family and the person who has a different surname has to file separate change of address for as an individual. You can mark it as a family move if the whole family which has same surname is moving to a new address, in that case all the people having same surname will get their mails forwarded to the new address by filing just one form. Third option is for the businesses moving to a new address. It is not possible to divert few mails to a different address; all the mails should be delivered to the same business address, either new or old. Once you have filled all three options, you can now click on the orange ‘Continue’ button to provide your name and address details. contain the First Name or initials of the Head of the family. Another important point to remember is that if you receive your mails by more than one name e.g. your middle name or nick name then a separate postal service change of address form should be filed for that name as well. Same goes with the last name and surname. Another important point, if a person who has the same surname is moving to a different address, then a separate form should be filled for that person otherwise mails of that person will also be forwarded to the address where whole family’s mails are being forwarded. Please remember, you can’t file for a change of address from a non USPS PO box, but if you have a USPS PO box, you should put that in the street field. The second block has the space for you to provide your old address information (not your previous address, this is the address where you are already receiving your mails) you need to be careful in filling this as any mistakes will complicate the process of changing the address with USPS. 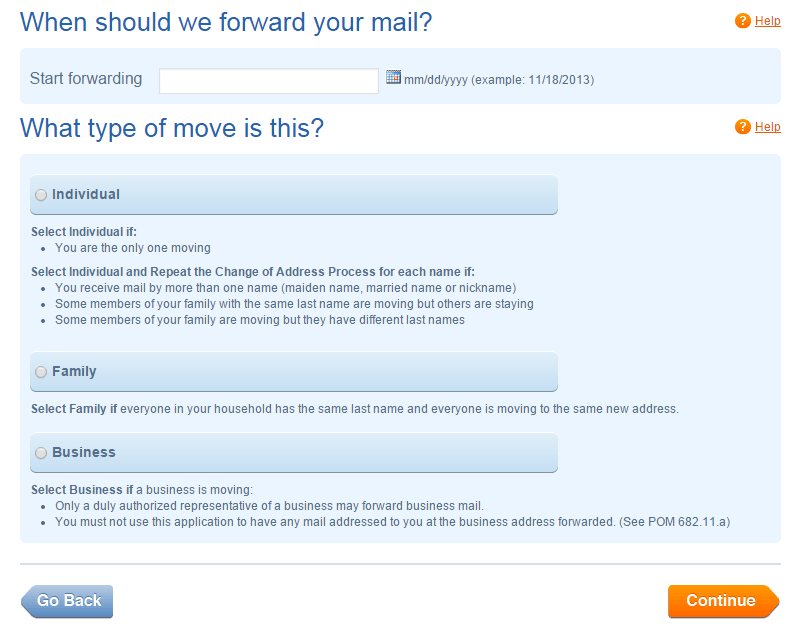 The third block is where you will put your new address or the address where you want your mails to be forwarded. If you are moving to a newly built house that was built in last six months, then it may not be in USPS database, in that case you must tick the box below the ZIP code. There are few type of address which you cannot use for these fields like you cannot file for a US Postal Service change of address from a non USPS PO box but if you have a USPS PO box you should put it in the street field. Similarly you cannot file Similarly you cannot file United States Postal Service Change of address online for international address or from a Military APO/FPO address, but you can file an online change of address to change your address ‘to’ a military address. Online address changing facility can also not be used to change ’Unique ZIP Codes’ address. Unique ZIP codes are used for specific universities, governmental agencies, buildings or business that gets a very high volume of mails. Such offices are assigned a Unique ZIP code to funnel the mails easily. Once you are done with the contact information, press the orange “Continue” button to the next step of “Identity Check” and confirm your identity. In the Fourth block you need to provide your contact information including your email address, confirmation of email address, home phone and Mobile phone. This information is used to send the information of the transaction and confirmation of the change of address and mail forwarding. 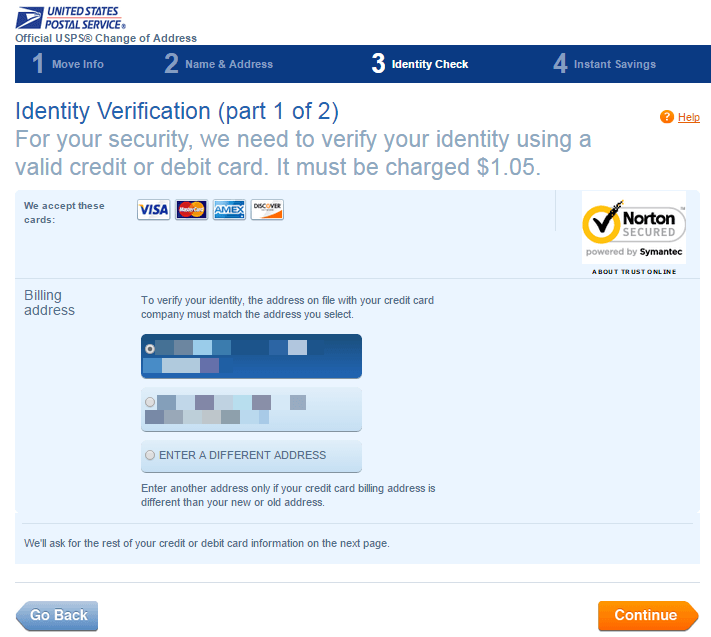 Third Step of filling the form is Identity Verification, this step helps USPS verify the applicant. It require you to verify yourself using a valid Debit or Credit card, this card should be in the name of person filing the request and it should have the same billing address as either your old or new house. USPS charges a $1.05 fee to verify the ownership of the card. This helps in preventing fraudulent address changing requests and also saves you from your friend’s playing prank on you. When you fill this page, it will show you both of your address (New where you are moving and old from where you are moving) to select for billing address; you can select the right address on your card. If your card is billed on any other address (a third address) then there is an option for entering a different billing address of your credit card or debit card. If you mark the third option of “Enter a Different Address” a new address field appears where you can enter your billing address. 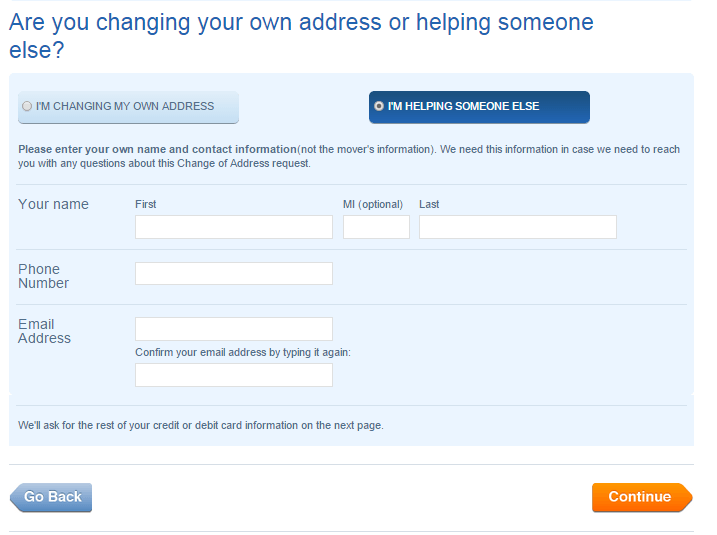 In case you are making the payment on behalf of someone else, there is an option to mark “I’M HELPING SOMEONE ELSE”. If you mark that field, you will have to provide your details like Name, Phone Number and Email address. Once you are done with that, you can click on the Continue button to move to the next step. If you feel like you have not provided the card information, please don’t afraid as USPS will ask that information in the next step. On the next page you will be asked to enter your card information, once you do that, your United States Postal Service change of address process will be done. While you are filling the form, you will see a vertical orange box on the right hand side of each page, this box shows all the information you have filled during the whole process and if you want to make any corrections or changes, you will find an edit button in front of each field, at any stage, you can click on edit button and it will take you to the respective page to make the edits. Please note, the address you see in the box is standardized by USPS database the moment you enter it, so if you see any difference in the format of address you filled and the address you see, it may be due to the database address, and you can leave it like that. Once you have checked and verified the details, you can be sure that your change of address is applied and it will start forwarding your mails to your new forwarding address within fourteen days. Thanks for the detailed article, it was really helpful for me. I have to apply in next week and I just wanted to know how i is done. This article has made me really happy to know that this process is really simple. I was really afraid of doing it online after reading all those scam and consumer complaints. But now I am confident about where to do it. Just want to ask one question, is the payment really necessary of we are doing it online? Yes, it is. If you are doing it online then making a payment also helps to verify your identity, this way you are safe. Very informative article, thanks for all those detailed images. they were really helpful. I will be moving from NYC to SF right after Christmas, but if I do it around that time, wouldn’t USPS be closed around that time? You can do it up to 3 months in advance, so if you do it now and mention the date when you want the forwarding to start, it would be done. That is why the 3 months in advance and 30 days after moving this facility is available. Great information and the whole process is discussed very clearly. I heard too much about the scams around changing of address in post office. Thanks you for clarifying that US Postal Service charges only $1.05 for change of address. Last time I moved, I used a service which charged me $24 for the same. Postal Inspection Service also alerts about such services. Here is the link https://postalinspectors.uspis.gov/pressroom/schemealerts.aspx that says some people were charged up to $40. Thanks for adding to the information. Why are they charging $1.05, are they not supposed to do it for free? We already pay for the shipping charges so why pay this. That $1.05 charged by USPS is more important towards the security then the service charge. This way they can always track who applied for the address update. I agree with the point that people receiving mails on more that one name should file a separate form for both the names. It happened to me last year, I receive mails with my nick name also, and when I moved, I filed for the First Name and Last name only. Then I noticed that my mails which used to come by nick name are not coming any more.I checked with the local postal office and they told me I need to do it for my nick name as well. of blogging, that in fact how to do blogging. I love the way you have blogged about changing the address at USPS. This is the exact information I was looking for. Liked you on FaceBook. My nephew lives across the street from me on the same street, but he will be moving in with me. He doesn’t have a credit card so my question is – can he do the change of address online and me paying with my credit card? Thank you in advance. No, he can not use your credit card. He should do it from the nearest post office. Wow, that’s a really great step by step tutorial I have found online about free change of address form, I know it is not free but you really made it very clear why the amount should be charged. If it was free, then anyone would change my address and get all my mails. USPS will probably never be able to figure out who filled it. It is a really great way to keep us safe. I saw some complaints of overcharged cards like http://www.cnbc.com/id/100908339 and I am happy that you have linked to the official USPS site clearly so that nobody is misguided. I am a single dad of 2 yr old and really have no time to visit post office, this was the reason I wanted to do it online. I kept your site open in one window and USPS official site on other window and filled the form really quickly without any problems. Thanks you very much. I will share it on my FB and Twitter with my friends. I went to my nearest post office for change of address and saw there was a huge line, that is when I got to know about online change of address facility. Your site helped me understanding the process before I started. I must thank you for saving my time, and thanks for the official link. I searched on google and there were lot of providers which look like scam and charging upto $80 for the same thing I did on official USPS change of address page for $1.05. Many people say it is free but I could not find the free option and when I read here, i got to know why it is not free. I will say it is nearly free as the validation charge is justified. US Postal service is really struggling these days for funds as I keep seeing that in news that many post offices are closing down. I am sure this little charge will help them. This is not good, us postal service ask money for change of address? why they need to charge us, we pay for postage and stamps and many other charges, why do they want that $1 charge, i think they are hungry of our money. USPS can’t be charging me just because i want to change my address to a new address. That is for our safety, it varify you as a person staying in the address. USPS is doing it for a reason, you get the peace of mind for a $. When ever you move to a new address, the formality remain same. So you have to apply if you move to a a new address, every time. I moved for work last year had to notify tons of banks magazines etc ended up hiring a website that helped a ton I think it was $20 worth the money for me, you could spend all day trying to contact all of the companies but with one of those companies you just list your services and they get you the right info and help you handle it, helped a lot. Mark, it is good that it worked well for you. But you can get the same thing done at USPS official site as they are diverting all your posts to your new address for a whole year. And the cost is much less, just $1.05. The link you have posted for UMove as usps.com/umove is not working, can you provide the updated link please. Thanks Steven for the headsup. I have posted a note above to let readers know about the change. Since the page has been removed and not just moved, I have not posted the updated URL. But we are going to look into it again in few days it the page is redirected to a new short URL. Here is a post about this update – usps.com/umove Has Moved To New Address Hope that helps. You save a lot of my time. After reading your post, changing my address was apiece of cake. Keep the good work. Thanks for the kind words George. Such things keep us motivated. Why do we still need to pay that $ amount. We didn’t buy that address from USPS. Thanks for your comment Mark. It is for your safety, imagine someone changes your address without you knowing it. How can I do free change of address, no credit card is there to verify? How can I did free address change af Ter I moved? I lost my cards during the move and now if I file for address change, all my cards had old address, so they will be sent to my old address.